Everyone deserves a little holiday cheer this season and Kaboodles Toy Stores are doing so with their 5th annual charitable toy drive. On now until Christmas Eve, you can visit any of Kaboodles’ four locations to participate in this fun and meaningful toy drive. You will receive 10% off items purchased for the Toy Drive from now until December 24th, and all donated gifts will be delivered to the Lower Mainland Christmas Bureau. The LMCB helps families in need by providing gifts to their children this Christmas. They have been dedicated to making Christmas a little more special for struggling families since 1930. Visit Kaboodles in Point Grey, Cambie, Granville Island, or in Victoria to help them collect hundreds of gifts for struggling families this year. Another BIG incentive to support the Kaboodles Toy Drive is a Miss604 giveaway! Kaboodles has offered up a $100 gift card for me to award to one lucky winner. I will draw one winner at random from all entries at 12:00pm on Monday, December 3, 2018. Follow Kaboodles on Facebook, Instagram and Twitter for more details, deals, and news. Update The winner is Robyn! My kids love the toys I got them from kaboodles last years, they are such a lovely store. That would be perfect for a special boxing day birthday present for my eldest son. Things are finally getting back to normal since my son beat his brain infection we’ve slowed down on alot since then. Itd be perfect this winter. My son and I both love Kaboodles! It would be amazing to win! Would love to win this awesome giveaway for my family! Thanks for this Miss604! I need to get a baby shower gift and this would be fantastic! This would be amazing to win as kboodlee carries the best selection of toys! Fun for every age, even me! Thanks for the opportunity!! Kaboodles is a great place for plush animals! I would love to go to Kaboodles for my Christmas shopping! I love going to Kaboodles! It always takes us a long time to decide b/c there are so many awesome toys there. Kaboodles is such a fun store! We love to visit Kaboodles. Thanks for the contest! What a fantastic way to support charity. Kaboodles is such a wonderful store! Kaboodles is a great store! Love Kaboodles toy store! My little one could spend hours in there! I love shopping at Kaboodles and would love to support the toy drive! This would be a great gift card to use at least partly to support a local charity! I’d love to check out this store!! Would love to give my sister family . Joseph, my brother-in-law, found out he has Colon Cancer, back in January. A rare aggressive type. A week after he and my sister, Tamra, found out she was Pregnant, with their second child. Now, they have two beautiful children; Micah, their 3 year old boy, and 3 month ,old daughter, Naomi. This would really help with my Christmas shopping! Wish Kaboodles a successful toy drive this year! Thank you for the opportunity to participate in this contest. Good luck everyone. I think Kaboodles will have have some fun and entertaining toys… gotta visit. This would be amazing help for my 3 boys. Kaboodies is so much fun! Thanks! I have some toys I can donate. What a nice program. Thanks for bringing this to our attention! Would love to buy toys from this store for kids in need. This would be like Christmas arriving early! I’d definitely get something for my kids but it would be nice to be able to give back too! I grew up going to Kaboodles, love that store! We love Kaboodles! My daughter could spend hours in there if I let her – they have so many great toys. This would be a great gift that you could pay forward with! Oodles of fun at Kaboodles! What a treat for the grandbabies! Liked and tweeted! Would love to win this for my little one. I go to 10th Ave. Kaboodles for my grandkids birthday/Christmas presebts. Great selection of toys. I still love going in and checking out the toys. Such a great store. Such a fun place to shop. I’ve totally forgotten about Kaboodles! What a great idea to do a toy drive. Lots of kids could sure benefit. Such a fun place to shop for my little one ❤️. Our son won’t want to leave the shop! Never heard ofthe store til now. Thanks for the article no I have! Such a fun place for my little ones! This auntie running out of cash! Yes please! Would love to get some presents for my cousins and friends! This would be a great help with my Christmas shopping! I definitely have some kiddos I could spend the money on! I love Christmas shopping for young children. 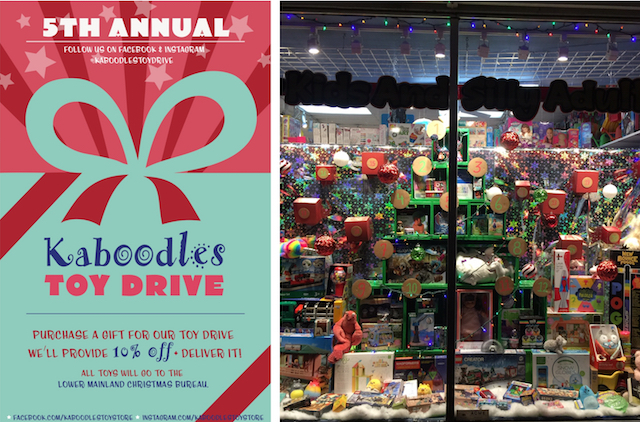 Kaboodles is such an amazing store, we always contribute to toy drives at Christmas! This would be great to pick out some special Christmas gifts for my niece and nephew. Another great locally-owned independent store!